Feng Shui is the ancient Chinese art of arranging objects in a home or building to encourage positive energy flow or Chi. Although the practice has a variety of applications, one of the most common is to create a happy home environment. 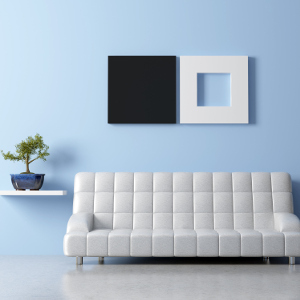 It’s not especially complicated to take advantage of the basics of Feng Shui; a few tweaks can inspire positive changes in your home. Here are six tips to help you get started. It's fairly well known that mess equals stress, so it should come as little surprise that one of the main premises of Feng Shui is to clear away any clutter. Clutter causes a build-up of stagnant energy and decreases the amount of happiness entering your home. A good place to start is the hallway; any positive vibes you create here will circulate throughout your home. Light is another principle of Feng Shui. Opening curtains each morning to reveal clean windows allows positive energy to enter your home. Conversely, draw them tight each night to prevent negative energy (darkness) from affecting your surroundings. Natural light is preferable, but if that is not possible, use artificial light in gloomy corners of your home. Feng Shui practitioners believe that the natural green tones of plants can help nurture growth and creativity, and fill your home with therapeutic energy. There are no bad Feng Shui plants as such; a plant’s effectiveness is more to do with their placement or bagua. That said, plants such as Areca Palm, English Ivy, and Boston Fern have air-purifying qualities. Consider contacting a live psychic if you need advice on what plants you should get and where to place them. Consider removing items that remind you of painful relationships or past failures. It is hard to create positive energy when you surround yourself with items associated with negative memories or bad experiences. Broken items are a strong source of debilitating energy. This energy can easily attract negative health and money issues. Take some time to fix any broken items. If they are beyond fixing, throw them away or recycle them. If they are fixable, but not by you, give them to a charity shop or pass them on to someone who is able to breathe new life into them. Your home speaks to your subconscious—a metaphor for what you truly want in your life. It’s important to make sure that your living quarters reflect what happiness means to you. One way of achieving this is to place photos and images of you and your family and friends around your home. Don’t store your best memories on your computer or phone. These tips can help you remove negative energy from your home and boost the happiness that surrounds you. Try putting them in practice today, and see how much better you feel tomorrow. If you would like to find out more, a Feng Shui tarot reading may help.